He was first elected to the U.P. Legislative Assembly in 1937 from Chhatrauli, and represented the constituency in 1946, 1952, 1962 and 1967. He became Parliamentary Secretary in Pandit Govind Ballabh Pant's Government in 1946 and worked in various departments such as Revenue, Medical and Public Health, Justice, Information etc. In June 1951, he was appointed Cabinet Minister in the State and given charge of the Departments of Justice and Information. Later he took over as the Minister for Revenue and Agriculture in the Cabinet of Dr. Sampurnanand in 1952. When he resigned in April 1959, he was holding charge of the Department of Revenue and Transport. In Shri C.B. Gupta's Ministry he was Minister for Home and Agriculture (1960). 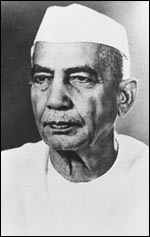 Shri Charan Singh served as Minister for Agriculture and Forests (1962-63) in Smt. Sucheta Kripalani's Ministry. He gave up the Department of Agriculture in 1965 and assumed charge of the Local Self-government department in 1966. After the Congress split, he became the Chief Minister of U.P. for the second time in February 1970 with the support of the Congress Party. However, President's Rule was imposed in the State on October 2, 1970. Few political leaders in the country could match Shri Charan Singh in their command of popular will at the grass-roots level. A dedicated public worker and staunch believer in social justice, Shri Charan Singh's strength stemmed essentially from the confidence he enjoyed among millions of peasants. Chaudhary Charan Singh led a simple life and spent his spare time reading and writing. He was the author of several books and pamphlets, including 'Abolition of Zamindari', 'Co-operative Farming X-rayed', 'India's Poverty and its Solution', 'Peasant Proprietorship or Land to the Workers' and 'Prevention of Division of Holdings Below a Certain Minimum'.